I don’t know how much my readers have studied statistics, but we live in a data-driven culture where people (at least pretend to) make decisions based on numbers. Last year, if you’ll recall, I took the district grades and compared them to district poverty rates, using free and reduced lunch percentages as a proxy, finding a -.44 correlation. That would be considered a strong, negative relationship, meaning that as poverty increases, there is a strong likelihood the grade decreases. This year, I looked at site grades and found an even stronger correlation (-.60). I should mention a few things about this data. School data is more specific than district data. A school district with 20 schools is going to give averages that mask the highs and lows of individual sites within it. Another is that on so many levels, this year’s school report cards just don’t compare with last year’s. The formula last year was actually crazier, using a 4.0 scale rather than a 0-100 scale, and giving 0 points for categories receiving a grade of F rather than a value somewhere between 0-59. Most importantly, I should remind readers of a key statistical principal: Correlation does not equal causation. In other words, two variables that are strongly correlated do not necessarily have a cause and effect relationship between them. Poverty is complex, and understanding how it contributes to the trend line requires further information. Looking at other variables within school sites, I was able to calculate more correlations to schools’ report card grades. This is a strong, negative correlation, meaning that schools with high numbers of minority students are likely to have lower grades. Again, think of the cautionary note above. These schools do not have low grades because they serve minorities. A better explanation is the fact that so much of the state’s minority population is poor. I ran another test of the more than 1700 sites with usable data and found the correlation between poverty and minority percentages to be .62. We have a poverty problem in Oklahoma, and it impacts minority students disproportionately. This is a moderate, negative correlation, meaning that schools with a lot of students moving in and out during the school year tend to have lower grades too. Again, this is a bigger factor in schools with a lot of poverty, but it’s actually a tricky statistic. Students whose tests are labeled Not Full Academic Year (NFAY), do not count in a school’s accountability reports. Maybe this correlation is a residual effect of student poverty, then. Perhaps it also has something to do with the disruptive effect of student movement during the school year. When a child enters a classroom, there is a time period for him/her to get used to the new environment. The reciprocal is true as well. Teachers need time to get to know their new students. A permanent record doesn’t fulfill that need. Nor does a series of test scores, even when transported through the state’s student data system. High mobility rates interfere with the ability to develop relationships, and they’re entirely outside of a school’s control. Statistically, this is a negligible relationship. (The accepted convention for weak is +/- .20 to .29.) If we are to accept that this relationship exists, we would say that it is very small, but negative. Absenteeism tends to hurt test scores. Again, there tends to be more of it in schools serving greater numbers of students in poverty. Even back in the API days, attendance was a factor in school and district scores. While schools cannot promote rules and practices to deal with student mobility, they can for attendance. I’m also open to the idea that this relationship is polluted by the bonus points most schools received (all or nothing). That can definitely skew things. This is another one I have to think about a little bit. The relationship is negligible, but if it is there, it is negative. More special education students may mean a lower grade. It makes sense, conceptually. Students on an IEP take more individualized teacher attention. It’s bound to have an impact. I just thought it would be a bigger one. These values are for high schools only, showing that schools with higher average ACT composite scores have a high likelihood of having higher report card grades (and the same thing, to a lesser extent, to schools with a high college-going rate). This year, high schools had much higher grades than middle and elementary schools. We know that preparing children for college takes more than the last four years. The other eight matter too. Yet the feeder schools for some of the top-scoring high schools have much lower grades. It doesn’t make sense. There are solutions to all of this. First comes with the acknowledgement that student achievement is impacted by socio-economic factors. Schools need support with the variables impacting student performance. We don’t need the state superintendent continuing with her new campaign strategy (and a poor one at that) of ranting about lost generations. That insults everybody who has ever worked in a school. It insults students and parents from past generations. It does even less to help children than these arbitrary report cards that tell us nothing we don’t already know. I just read a study, “Are ‘Failing’ Schools Really Failing?” By Downey…their study compares and contrasts ‘achievement’ measures, which we have, ‘learning’, which I believe is pre-post, and something called ‘impact’ — the difference bwteen school-year learnign and summer learning rates. They found the same thing you have when we ONLY look at achievement, based on standardized tests. Your findings are so disappointing…but we’ve known for years one of the things standardized tests really measure is poverty. educationtruths, you have followed the State Report Card closely. What can you tell us about the comparability of these “scores”/”grades” over the last several years? Is it comparing apples and oranges to look at the scores from year to year? The careless and controversial way that grades have been handled year after year suggest that they are not comparable, and therefore especially useless. You have more familiarity with this issue — what’s your take? It’d take a lot of work to go back and compare these scores to API scores, and unfortunately, in their effort to be transparent (or pretend they invented accountability), the SDE has taken down old report cards. Looking at last year’s report cards, though, it’s hard to see similarities. First, there was a different scale in place for test scores. Second, there were four categores. Finally, the introduction of bonus points really skew things. Several schools saw improvements in their test scores while their letter grade dropped. That makes looking at the two years side-by-side completely meaningless. 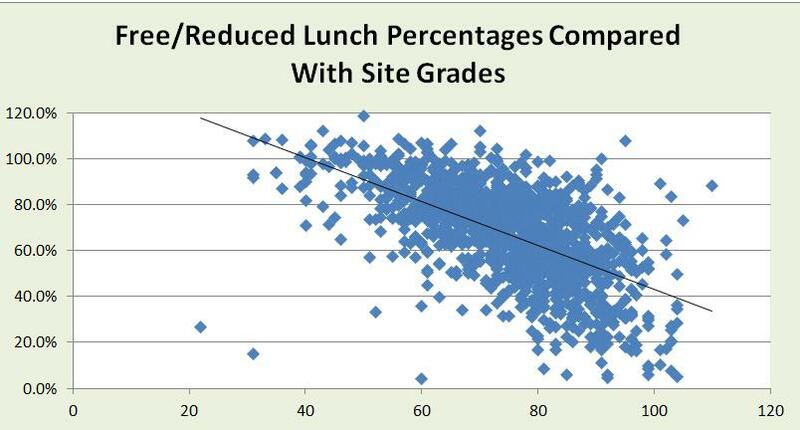 Charter School Grades (2013) Mystery Solved: Measured Progress Wins!